Review: I Know I Am, But What Are You? 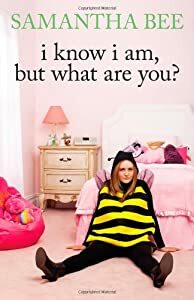 Cover of I Know I Am, But What Are You? Samantha Bee’s long been one of my favorite Daily Show correspondents… which is more true than you may expect, since she’s been with the show forever. I think the only person on there now who’s been on longer is Jon Stewart himself. Anyway, being a fan of hers, I was excited to learn that she’d written a book. It’s more a memoir than a book of printed routines, though since she’s not really a stand-up, that makes sense. When she’s on, though, she is definitely on — like the chapter about when she (and future husband/fellow Daily Show correspondent Jason Jones) performed in a stage-show loosely based on Sailor Moon. The ineptness of the production combined with the surliness of the actors makes it pretty hilarious, particularly when she relates how Jason, as Tuxedo Mask, would let the children ask Samantha, as Sailor Moon, questions. I won’t spoil the bit, but it was one of those situations where I was trying very hard not to be the loony on the bus laughing at seemingly nothing. I don’t think I succeeded. While I Know I Am, But What Are You? isn’t the best book to come from The Daily Show (I’m still partial to America (The Book), not just because it’s got a real-live fold-in from Al Jaffee), if you’re a fan of the show, it’s worth a read. It’s pretty quick and enjoyable — and it’s often surprising how much trouble a future fake newswoman could get up to in Canada.